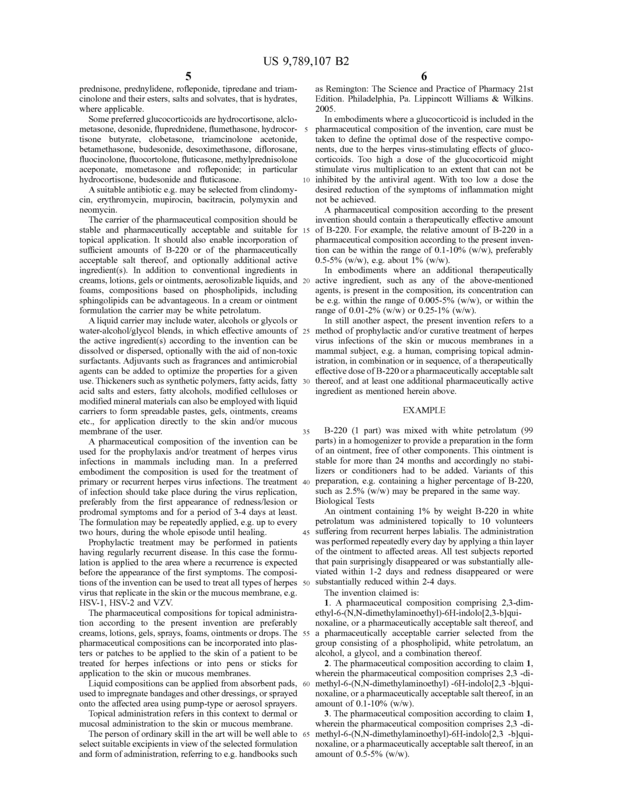 A pharmaceutical composition for topical administration including 2,3-dimethyl-6-(N,N-dimethylaminoethyl)-6H-indolo-(2,3-b)quinoxaline(B-220) or a pharmaceutically acceptable salt thereof in a pharmaceutically acceptable carrier The composition is useful for the treatment of herpes virus infections of the skin or mucous membranes in a mammal subject. 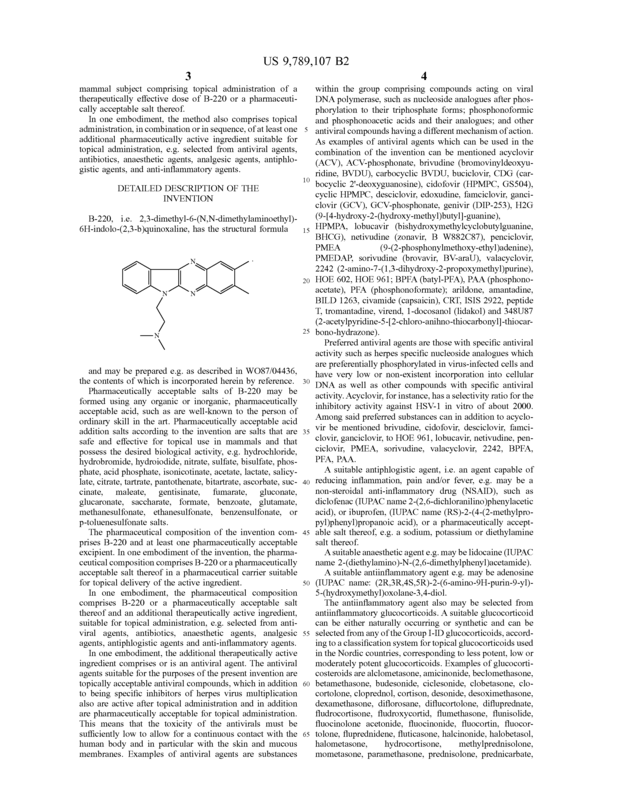 A pharmaceutical composition comprising 2,3-dimethyl-6-(N,N-dimethylaminoethyl)-6H-indolo[2,3-b]quinoxaline, or a pharmaceutically acceptable salt thereof, and a pharmaceutically acceptable carrier selected from the group consisting of a phospholipid, white petrolatum, an alcohol, a glycol, and a combination thereof. 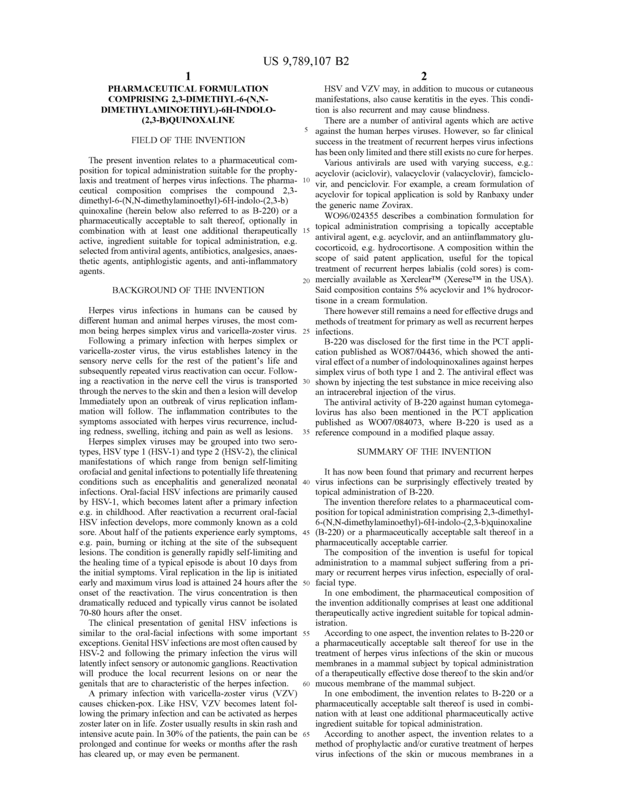 The pharmaceutical composition according to claim 1, wherein the pharmaceutical composition comprises 2,3 -dimethyl-6-(N,N-dimethylaminoethyl) -6H-indolo[2,3 -b]quinoxaline, or a pharmaceutically acceptable salt thereof, in an amount of 0.1-10% (w/w). 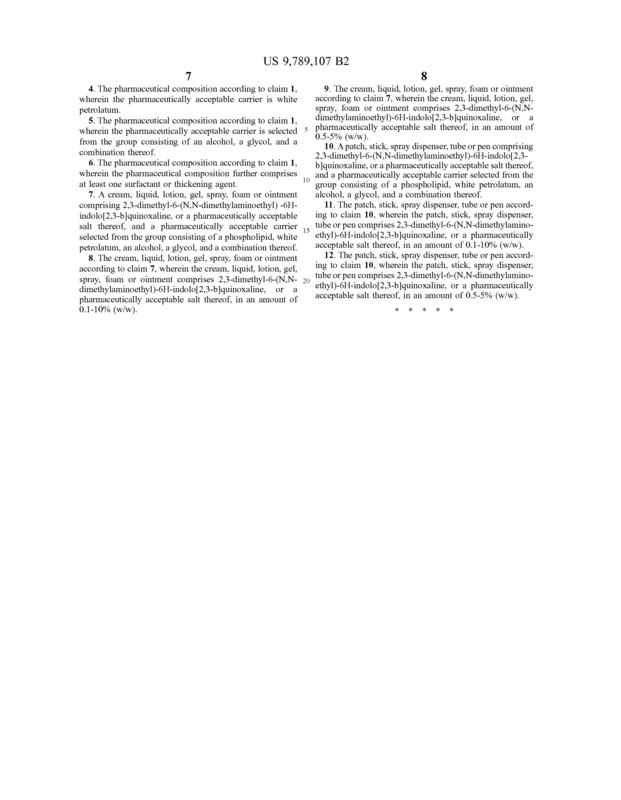 The pharmaceutical composition according to claim 1, wherein the pharmaceutical composition comprises 2,3 -dimethyl-6-(N,N-dimethylaminoethyl)-6H-indolo[2,3 -b]quinoxaline, or a pharmaceutically acceptable salt thereof, in an amount of 0.5-5% (w/w). The pharmaceutical composition according to claim 1, wherein the pharmaceutically acceptable carrier is white petrolatum. The pharmaceutical composition according to claim 1, wherein the pharmaceutically acceptable carrier is selected from the group consisting of an alcohol, a glycol, and a combination thereof. The pharmaceutical composition according to claim 1, wherein the pharmaceutical composition further comprises at least one surfactant or thickening agent. 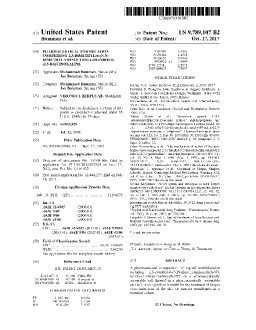 A cream, liquid, lotion, gel, spray, foam or ointment comprising 2,3-dimethyl-6-(N,N-dimethylaminoethyl) -6H-indolo[2,3-b]quinoxaline, or a pharmaceutically acceptable salt thereof, and a pharmaceutically acceptable carrier selected from the group consisting of a phospholipid, white petrolatum, an alcohol, a glycol, and a combination thereof. The cream, liquid, lotion, gel, spray, foam or ointment according to claim 7, wherein the cream, liquid, lotion, gel, spray, foam or ointment comprises 2,3-dimethyl-6-(N,N-dimethylaminoethyl)-6H-indolo[2,3-b]quinoxaline, or a pharmaceutically acceptable salt thereof, in an amount of 0.1-10% (w/w). The cream, liquid, lotion, gel, spray, foam or ointment according to claim 7, wherein the cream, liquid, lotion, gel, spray, foam or ointment comprises 2,3-dimethyl-6-(N,N-dimethylaminoethyl)-6H-indolo[2,3-b]quinoxaline, or a pharmaceutically acceptable salt thereof, in an amount of 0.5-5% (w/w). 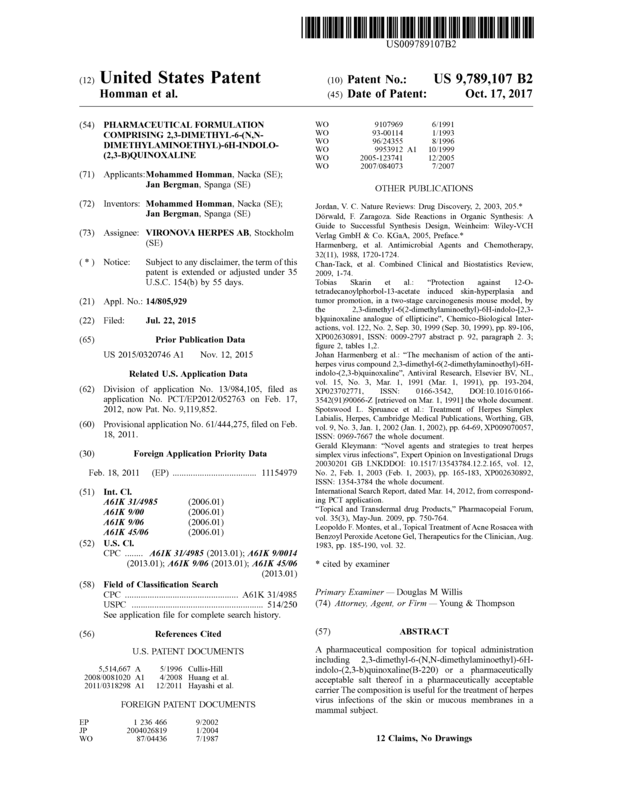 A patch, stick, spray dispenser, tube or pen comprising 2,3-dimethyl-6-(N,N-dimethylaminoethyl)-6H-indolo[2,3-b]quinoxaline, or a pharmaceutically acceptable salt thereof, and a pharmaceutically acceptable carrier selected from the group consisting of a phospholipid, white petrolatum, an alcohol, a glycol, and a combination thereof. The patch, stick, spray dispenser, tube or pen according to claim 10, wherein the patch, stick, spray dispenser, tube or pen comprises 2,3-dimethyl-6-(N,N-dimethylaminoethyl)-6H-indolo[2,3-b]quinoxaline, or a pharmaceutically acceptable salt thereof, in an amount of 0.1-10% (w/w). The patch, stick, spray dispenser, tube or pen according to claim 10, wherein the patch, stick, spray dispenser, tube or pen comprises 2,3-dimethyl-6-(N,N-dimethylaminoethyl)-6H-indolo[2,3-b]quinoxaline, or a pharmaceutically acceptable salt thereof, in an amount of 0.5-5% (w/w).